I hope you like to hear stories from winners and how they overcame great challenges. 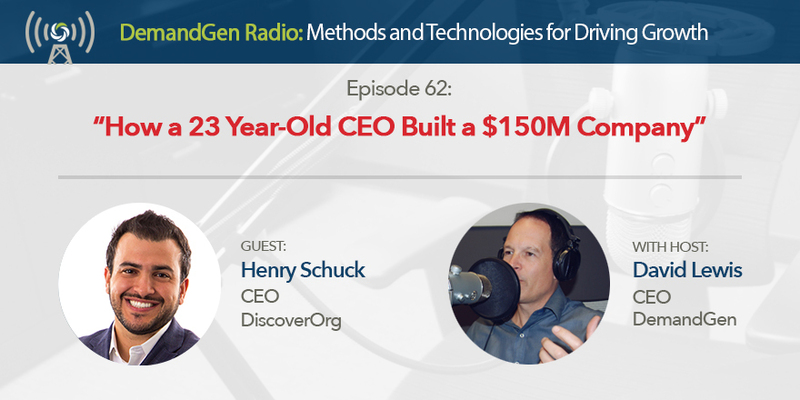 While Henry Schuck might not seem like an ordinary 23-year-old after creating a $150M company called DiscoverOrg, he certainly felt like one. Fear and self-doubt troubled Henry early on after starting the company. There were even a few times he was even willing to step down as CEO if investors thought that was the right thing to do. Fortunately, they didn’t. Henry and his vision has been exactly what the company has needed and I know you’ll enjoy hearing his story. In 2017, DiscoverOrg achieved what no other company has done so far by winning 4 Codie Awards in one year including Company of the Year, CEO of the Year, Marketing Team of the Year, and Sales Team of the Year.